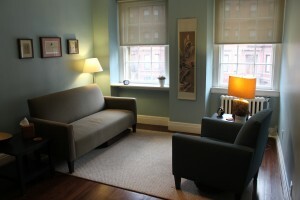 I was thinking about counseling office decor and was reminded of one of my first counseling offices. It was once the utility room located just off the back porch of an old house that had been converted into an office. There wasn’t much insulation and the furniture likely came from some abandoned building someplace. I had a few personal items in the office and seem to remember bringing some of my counseling related textbooks to put on a shelf. There’s a good chance I had my diploma hanging on the wall but that was probably about it since I wasn’t fully licensed yet. I’d like to think I still did okay counseling in that office and really learned a lot there. I mention all this to say that the office does not make the counselor. You can have the nicest office around but if you can’t connect and relate with your clients, it’s likely all for naught. I’ve seen counseling offices that feel like stepping into a spa waiting room. I’ve also been in a few that look more like a probation office than a therapeutic environment. The space you create is as much a part of your non-verbal communication as the way you sit or how you dress. So whether you’re just starting out and assigned to the worst space in the building or you’ve been at this for a while and have the corner office, there are several factors to consider when setting up your office. This is probably one of the hardest things to get right but also one of the most important. I can’t begin to tell you how many counselors I’ve seen set up client seats on the opposite side of their desk. How are you going to connect with a desk in between you? What message does this arrangement send? We need to be able to face our clients with a reasonable (and sometimes variable) distance between. We also need ready access to an exit for both ourselves and our clients. No one wants to be boxed into a corner. Arranging an office can depend on a lot of factors such as placement of doors, windows, electrical, phone outlets and furniture. You may not have many options here depending on where you work. Some counseling offices don’t use a desk at while others feature one prominently. Whether or not you utilize a desk depends a lot on how you work. I sit at a desk but turn to face clients who sit on their choice of a love seat or chair. A couple of comfortable chairs can also work well but make sure at least one is able to accommodate larger clients. If all you’ve got are a couple of uncomfortable office chairs (the plastic ones are the worst), that’s going to send a message to your client. This is one of the easiest things to fix that will have one of the greatest impacts on the environment. Bright fluorescent lights do not facilitate sharing. I’ve seen research that showed people in low lighting share more than those in brightly lit rooms, even when the brightly lit rooms were nicer. If you’ve got those horrible 48” florescent tubes in your ceiling, start by getting enough table and floor lamps so you can keep those overhead lights completely off. I’ve also seen people remove enough of the tubes to lessen the effect but in reality, the diffused light provided by lamps with shades is better. A well decorated office is only slightly less important than lighting. Decoration can also contribute to an increase in sharing but can’t completely overcome bad lighting. My taste is minimalist with very little personalization but preferences vary. A lot will depend on the type of clients you see. A room for performing play therapy will necessarily look a lot different from one being used for trauma therapy. I don’t want to distract clients with a ton of knickknacks or personal items but I also don’t want them to feel like they’re in an exam room. A throw on the back of the couch, some tasteful wall art, and a couple of decorative pillows can go a long way. I always encourage counselors to display their license(s), special certifications and/or diploma(s) tastefully where clients can see them. You don’t want to overdo it by framing every certificate or award you’ve ever received (perfect attendance from the 8th grade?) but you also want to communicate your professionalism and competence by displaying the most relevant information you can without overwhelming anyone. Reference books, college textbooks, and professional counseling books by your favorite authors can communicate a message of professionalism and expertise. A small bookcase with a nice collection of professional titles can tell the world you care enough about your craft to stay informed. If you specialize in addiction, keep plenty of those titles on hand. If you work with children, your bookshelf should say so. I like to keep a variety of titles on the topics that interest me. I also like to keep a handful of copies of Choice Theory (Glasser) on hand for when I want to assign reading as homework. One word of caution: if your books shelf is too specialized, you might alienate those who don’t fit that profile. Make sure your office smells good but don’t go overboard. I’ve walked in offices and had my eyes immediately start to burn because of the latest Scentsy offering. I love incense but again, I don’t want to overpower the office so I typically don’t use them unless I’m familiar with the product. Some clients also associate incense with marijuana use so you don’t want to trigger anyone! Essential oils might be a nice touch but let’s face it, some people are much more sensitive to odors than others. I like to use passive aromas or an adjustable plug-in device with variable output so I can adjust the strength to the space. I’m sure there are other factors I’m forgetting. I know wall color can have an impact but not everyone has the option to change their walls. There have also been volumes of research on that topic. But if you can think of anything else I’ve overlooked or have any thoughts on the factors I’ve mentioned, I’d love to hear from you.